Mostly when I talk about LEDs on this blog, it has to do with hand held LED flashlights. But LED technology is really taking off, from common light bulbs, to street lights, auto head lamps, and even stage lighting. 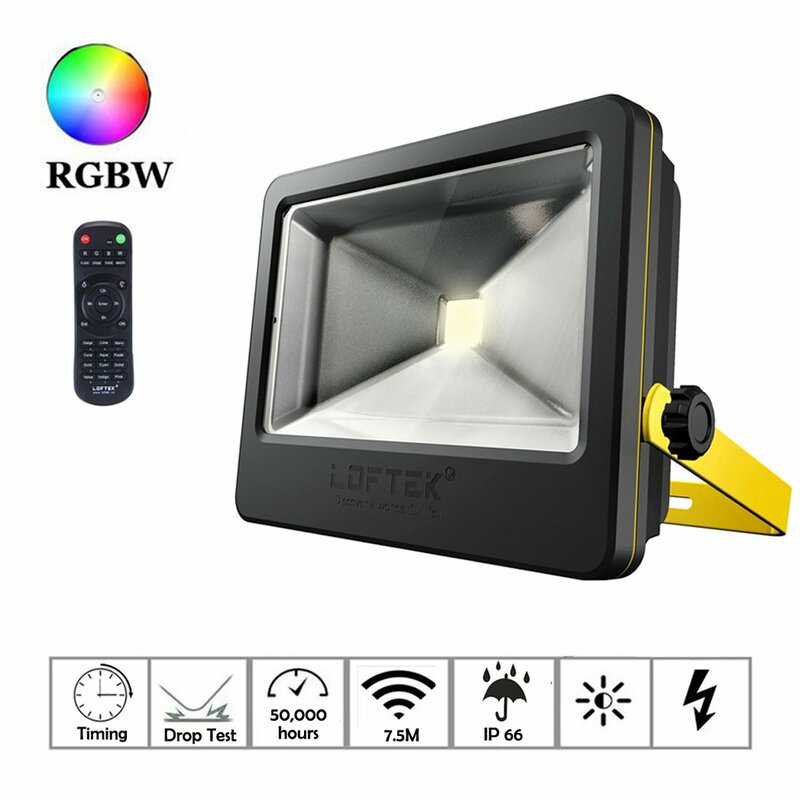 LOFTEK offered to provide a multi-colored LED flood light for review, and I’m happy to oblige since I know a thing or two about LED technology. This is a large, 110V plug-in flood light, though I would call it a “stage light.” It’s got three banks of different colored LEDs in red, green and blue, and comes with a remote control which allows you to change between all the colors and modes it has.The built in handle also acts as a stand or mounting bracket so the unit can be mounted to a wall or table. [Flood light Flash Sale]: Save $7 when you purchase 1 or more LOFTEK® 50W RGB Timing Floodlight. Enter code LKSALE07 at checkout. Code end at 09/20/2016 PDT. MULTI-COLOR & DIMABLE: Total 16 color tones and 4 flash modes (Flash / Strobe / Fade / Smooth) provide colorful and bright illumination across wide area. We can use it outside at a stage,garden during party time or inside as a security lighting,etc. MEMORY FUNCTION: More intelligent and convenient , it will remain the previous color on your setting when turn on again. And we can reset it to factory setting by the remote controller. Advanced Materials and Durable Construction: Aluminium Die-Cast Alloy shell and Tempered Glass. Impact tested & Vibration tested and Extreme Temperature tested before packing. IP66 waterproof design: Perfect Sealing design with high-quality material. Work well as outdoor and indoor bright applications/decoration: Especially suitable for garden, grassland, towering trees and building etc. When the manufacturer claimed 50 watts on this unit, I was mentally doing the math on how big the heat sink would need to be. That much power, even from a bank of LEDs, puts out a good bit of heat, and this light didn’t look very beefy in the product description. But when UPS handed me the box, it was much heavier than I expected, which means this thing has a lot of metal, which translates to good “thermal mass,” which is a good thing. Without being an electronics guru, the weight of the unit and the size of the cooling fins seem appropriate for 50 watts of output. The unit looks to be well designed and built. It has a steel housing with a steel mounting lever/handle. I don’t think it uses anti-reflective coating on the glass, but the glass itself looks thick enough, and has the IR receiver for the remote glued to the front. I don’t think it’s impact resistant, so I wouldn’t drop it face down. Everything else is there quality-wise: aluminum reflector, the bank of LEDs is mounted well, good quality cord, etc. They could probably stand to beef up the cord mount, but overall I think they did a good job with the construction, and it feels very solid. The manufacturer claims 18 watts per color, with a total of 50 watts with all three banks of LEDs turned on. I did some of my own testing with a “kill-o-watt” device that measures the load of any device that plugs into the wall. My tests ran in the 12 to 15 watt range per color, which isn’t too far from their claimed output. However, I couldn’t get white, or any other color to run all the LEDs at their full output, for a total of 50 watts. Maybe I missed a command on the remote, but it’s probably just as well not to run this thing at max possible output, because 50 watts is a lot for an LED. 50 watts for an LED is probably equivalent to 500 watts for an old school incandescent bulb that old people like me grew up with. The included remote has lots and lots of different color, mode and timing features. I spent quite a bit of time playing around with the remote, and seems to do just about anything you’d expect from a multi-colored LED floodlight. It has lots of flashy “disco” modes and you can even set it all on a timer. Below is a short video I made running through most of the modes. I noticed on some modes that it uses low frequency PWM, which is apparent in the video. It isn’t low enough to see with my eyeballs, but it’s close, and some people notice it more than others. The sensor for the remote is in the front of the unit and only sees commands from the remote when their is a line-of-sight between the front of the floodlight and the remote. It’s pretty responsive to commands from the remote, and there’s lots of things it can do. Output of this unit is decent for its size, but it’s probably suited to smaller venues like my brother’s brewery than a large club or stage. My brother is going to mount it on a wall to point down at a patio for parties and events. This is a neat toy, and I’ve had fun playing with it at parties, bathing guests and even the dogs in colors like green and hot pink. To me this product has a pretty narrow usage. It’s a little big for a small apartment, but a little small for a large club or stage. But for a backyard barbecue or small club, it’s probably ideal. So, as long as you’re using this in the right size area, I think it’s a good product.